I know you guys are getting sick of these, but it's that time again... B/W: Next Destinies Sales! Mmm, so many delicious cards in this set! Super cheap cards for you! I've also got some sealed booster packs, Online code cards, and US Promo bottlecap figures! I was just writing to ask if everything available on yahoo japan is legit or if you still get botties there? Also how can you tell if somethings a bootie if they only have a pic up and you can't read japanese? One last thing I saw this pic of an eevee canvas but wasnt sure if it was the 2006 version or the 2009 version, looks like the '06 version to me but what do you think? Updated Sales Post! No Lag! Hi everyone! I have revamped my sales thread and now everything is separated into its own sales thread now so you don't have to wait forever for the pictures to load. I have a lot of new items so come check it out! Click here to be transported to my sales. Remember all my items are negotiable in case you see an item that is priced to high! My Temporary Hold is Off! So GB for kids Payment 1 is in! One long overdue collection update!! I am really overdue for a collection update and I apologize! Life has just been keeping me busy and like I mentioned before, I have not been buying as much. So, where to start?! How about with some of the things I received for Christmas? Hey everybody, my name is Saúl as you can see, I'm from Chile, and also a new user here. I started to collect this year Pokemon Tomy figures (I did it when I was young... but there were few survivors for the years XD). I have like 50 or more from the first generation and a few from others upper. I also collect Pokemon TCG, especifly Pokemon Gold Stars, Shinings, Golducks/Psyducks and Suicunes. I want all of them. Also have mini collections of alakazams, mewtwo, and pokecats. No big deal. Amm... I'll like to get some Zukan ones, but I haven't seen so much of it, so I dont know wich ones do I want (obviously I'll like suicune's, golducks, psyducks, umbreon/espeon, and if there are porygon complete evolution set). Loved to play the gameboy and nintendo 64 games! The last game I played was Pokemon Diamond, what a work breeding Pokemons there! Effort Values and Gens... hahaha funny thing. 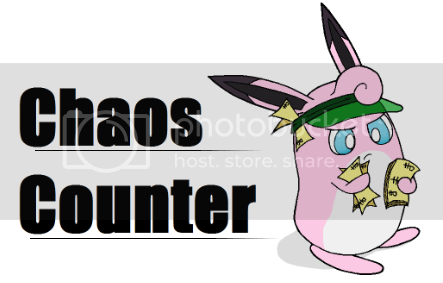 I find this site cause a girl in the facebook group of Pokemon Zukan! PD: Sorry for my bad english, I don't speak always and sometimes I dont know how to join ideas XD. And sorry if I'm doing something wrong, I espect you to tell and help me. Thanks! 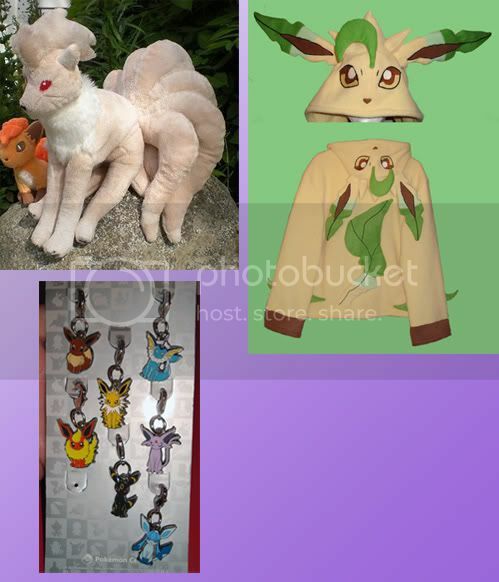 Eevee charm sales, Ninetales plush, Leafeon hoodie. I'm selling some Eevee charms, a Leafeon hoodie on etsy, and checking interest on a custom Ninetales plush. Hi, I just joined to today as a request from my sister who some may as know as p3nguina. I did grow up with pokemon but my interest in pokemon started when BW came out which has made me an avid viewer of the anime and game. Ok so from time to time I like to buy pokemon card booster packs, because they're fun to open and I tend to get good pulls, even though I don't collect the cards nowadays and don't play the game. I've been trying to find the mewtwo box for next destinies at my local target. No luck, so I bought three packs of the cards instead. All of my Kid Figures :D.
want to buy: pracoro dice and metal figures and marbles. Basically I managed to pick up a few mint-in-box battle dice which was a mistake because I really like them and now I want more. = 3= I have Charmander, Snorlax, Meowth, and Beedrill (I'll post a picture of the poses below a cut) and I just kind of want to expand my rainbow. Arcanine would be super but I am actually kind of looking to collect all of the things. Metal figures and marbles are also a want... Again, Arcanine/Growlithe are thebomb.com but I got a Ninetales metal figure from an awesome user named 99reddriffloons (I have no idea how to tag people .___.) for my boyfriend and it's cute and he told me to keep it with my collection for him and I want moar. ;______; I have a bajillion marbles already but I like them so meh. Some amazing gets I received over the course of these 2 weeks. Which means a collection update! It's massive so get ready for plenty of pictures. Also, if you have a luxray kid or a shinx pokedoll your willing to sell, it would be great in growing my electric lion collection! I'm afraid I cannot get the seller from the GA ALL THE THINGS BK GA to reply to me, and I have not received a parcel. I think we can assume the guy is a crook! I am going to start a Paypal dispute with him to get a refund for the members who paid. I'm sorry guys! In good news, the Glittering Hoard GA seller has finally marked the items as posted! They will be trundling their way to me soon I hope! Well, I checked the mailbox on the way to sending cards out tonight, and found I had a mid size mailer. I was a little disappointed that the self-service computer wasn't working, so all packages will have to go out tomorrow.